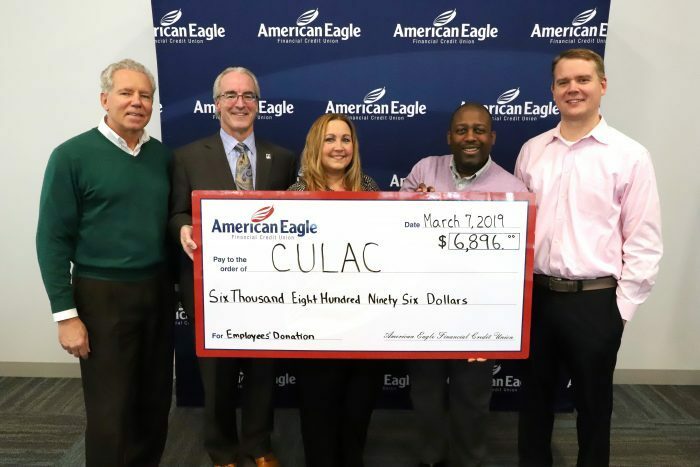 EAST HARTFORD, CT (March 20, 2019) — American Eagle Financial Credit Union (AEFCU) recently contributed close to $7,000 to the Credit Union Legislative Action Council (CULAC). Funds were raised via three separate employee fundraisers including a drawing for a chance to win a VIP parking space at AEFCU’s new corporate office, a 50-50 drawing during football’s “Big Game” in February, and Jeans Fridays. CULAC is a vehicle through which a credit union advocate can actively participate in advancing the future of the credit union industry. football winner John Conant (Executive Vice President, Chief Financial & Risk Officer), Dean Marchessault (President & Chief Executive Officer), Christine Willey (Vice President, Enterprise Risk Management), parking space winner Michael Turner (Project Manager), and Howard Brady (Senior Vice President, Chief Lending Officer). American Eagle Financial Credit Union is a not-for-profit financial cooperative headquartered in East Hartford, Connecticut. It is the largest community credit union in Connecticut with 13 community offices, 137,000 members, and $1.6 billion in assets. AEFCU operates retail offices in Bloomfield, Cromwell, East Hartford, Enfield, Farmington, Glastonbury, Manchester, Newington, Plainville, Southington, South Windsor, West Hartford and Vernon. AEFCU offers banking services to everyone who lives, works, worships, attends school, or works for a business or other legal entity, in Hartford, Middlesex, Tolland, or New Haven County. AEFCU was founded in 1935 by employees of Pratt & Whitney Aircraft. Member deposits are federally insured by the National Credit Union Administration (NCUA), a U.S. government agency. For more information about American Eagle Financial Credit Union visit www.americaneagle.org.